One of the greatest editing exercises I've ever done actually happened before I even knew I wanted to be an editor. In fact, it happened before I even had editing software on the computer. 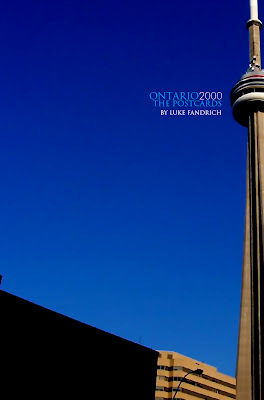 As you should have guessed by the title of this post, these edits were my Ontario Postcards that I shot in 2000. It was the summer. I was 16 and had saved up just over $1200 to purchase my very first digital camcorder - I'd never wanted anything so bad. My friends were buying cars, but for me it was the camera. At the end of August I was leaving on a vacation with my family to Ontario. We were heading to Ottawa, Toronto, and Niagara Falls to be exact. This proved the perfect opportunity to shoot some fresh footage. So what was the editing exercise? Well, I had made up my mind before hand that I wanted to shoot some polished looking videos of the locations we'd be traveling to. Without the software, and without the patience to try and edit on the VCR anymore, I decided that I'd create these videos in-camera. In-camera means exactly what it sounds like - shooting using only the camera effects, creating your edit as you go. I picked out my music before hand, but I still can only imagine what I was like to travel with. Because I was shooting in-camera, I had my discman with me and I'd play the selected song while I shot to match up my cuts. This was the case for Ottawa, Toronto, and Niagara Falls. If you can imagine keeping a song on pause while touring, keeping in mind what you last shot and how it connects to the new location, all the while ensuring that you're still synced up to your video footage so that the rhythm is intact - that was the routine. The very idea of it seems ridiculous now with cheap and free software for video editing so easy to find and use. The digital revolution has changed everything, and it's crazy to think of what a different world it was 9 years ago. 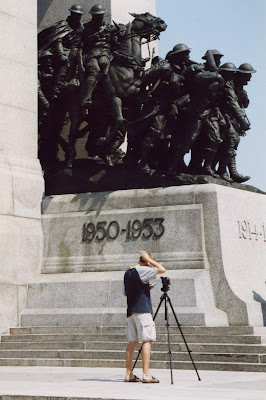 *Me filming at the War Memorial in Ottawa. You can see my discman in hand as I set up my shot. Not surprisingly, almost all the photos from this trip with me in them look like this. When I got back from vacation school started up right away. Having made myself familiar in the communication technology department, I was able to use their dubbing equipment and added my music to my in-camera videos. All these years later, the edits are still exactly the same. I didn't shoot any additional footage because of my chronological in-camera project for one thing, but I don't think I could bring myself to change them even if I could. The experience of shooting this way not only proved valuable as I developed my own video skills, but it was truly one of those early tests that really allowed me to prove to myself how much I wanted to do this. That history and energy still motivates me in the things I approach today. I remember in early 2003 in my very first production class in film school one of the assignments was an in-camera edit. Upon this announcement I showed my friend Ward my Ontario videos, explaining how they were made, and sure enough the project felt like a breeze in comparison. Ward starred in my film school in-camera project, Mean Mr. Mustard is Homeless. Today, the only real difference in my Ontario Postcards is the addition of the titles, postcard border, and a clip of a WWI soldier in my Ottawa video with the war memorial. The music and cuts are otherwise exactly the same. In addition to these edits, I put together a short clip of the only home video footage I shot while in Ontario. After we left Ottawa, Toronto, and Niagara Falls we went to stay with some family and went sailing on their boat through the Trent-Severn Waterway. Traveling through the locks was certainly an experience for this prairie kid. Until right now - this footage has never been used or even watched since it was shot in 2000 (I'd forgetten that it even existed). All this said, these edits remain my earliest work that I still screen as they were originally cut and presented. Most of my work has had a cosmetic update or been put into context for this blog - these edits were already YouTube ready before YouTube even existed. I remain extremely proud of what I accomplished from a technical point of view, and it's work like this that now makes it so clear why my focus became directed towards editing. See for yourself the result of my early filmmaking challenge. I love the Niagra Falls postcard. Lovely work! I graduated with a film degree in the early 90's and wish I'd stuck with it. Good luck! Thanks Dana! It's never too late to get back into video - all the equipment is so much more accessible these days it's easy to pursue quite casually. Great work!! The Niagara Falls postcard is very different postcard and I love the design of it.